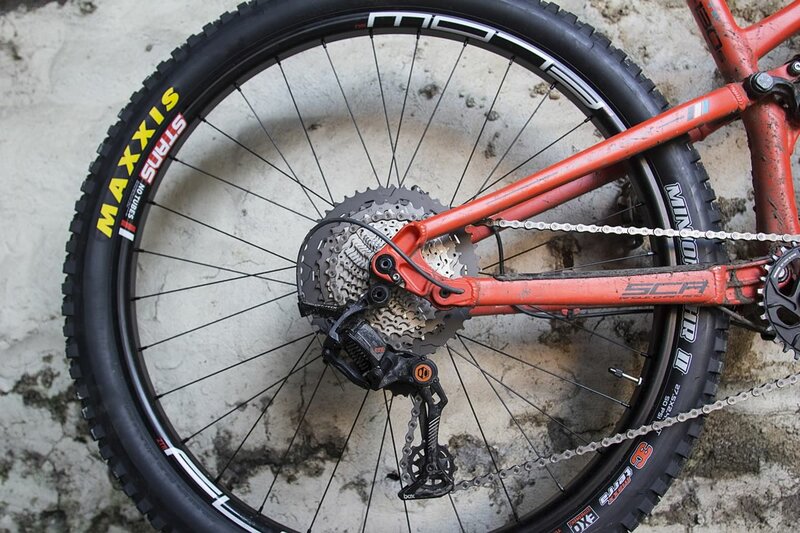 Rewind to Issue #110 of Singletrack Magazine, for our review of the Box Components 1×11 Drivetrain. 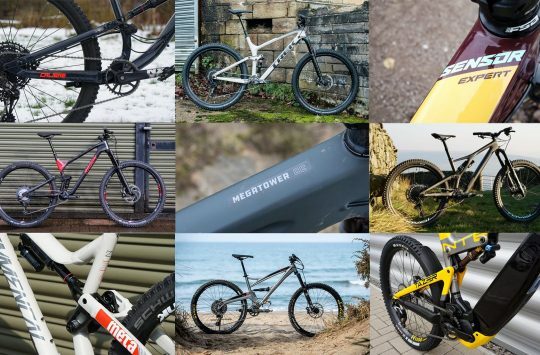 Box Components is a relatively new player to the mountain bike market, though the US company has offered various handlebars, stems and wheels for a little while already. However, it was the news of Box Components showing a 1×11 drivetrain at Eurobike last year that really caught everyone’s attention. The Box One 1×11 rear derailleur and matching PushPush shifter. Designed specifically for modern, wide-range 1×11 drivetrains, the unique Box One PushPush shifter features a single paddle to operate both down and upshifts. 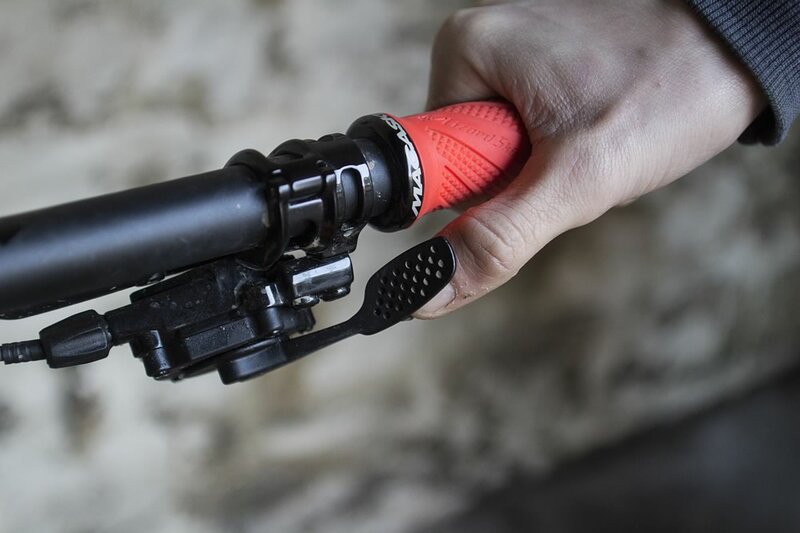 It’s a thumb-only affair, where you press the thin alloy lever as normal to downshift (to easier gears) up to four gears in one movement, and push the lever in TOWARDS the stem to click up one gear at a time. A small perpendicular shelf sits on the backside of the lever, which your thumb wedges into for firing off upshifts. There is only paddle on the Box One shifter. A small shelf on the backside allows you to press the lever in towards the stem to upshift. Due to the nature of the PushPush design there is no adjustability of the lever angle, but the bar clamp does allow for two-position mounting. That’s useful, because set-up is crucial for getting the Box One shifter sufficiently close to your thumb. 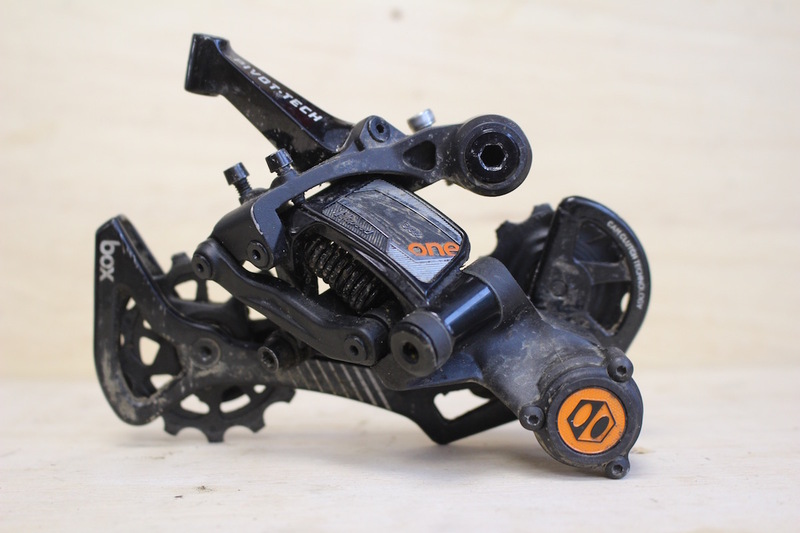 The Box One 1×11 rear derailleur. At the other end, the skeletal Box One rear derailleur is mostly made from alloy, with a carbon composite P-knuckle housing Box’s patent-pending CamClutch. The cage is alloy, and the upper jockey wheel is offset to handle up to a 46T cog. 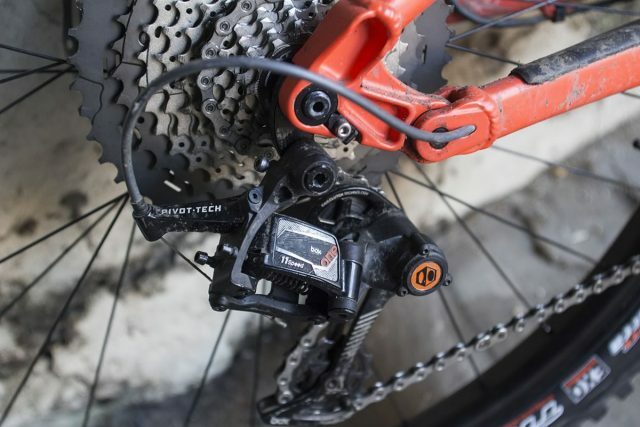 Like the Box One shifter, it’s also cross-compatible with Shimano 11-speed MTB components (and SRAM’s 11-speed cassettes, but not its shifters/mechs). For the past few months, I’ve been riding with pre-production versions of the Box One derailleur and shifter with both a SRAM 10-42T cassette and a Shimano XT 11-46T cassette. 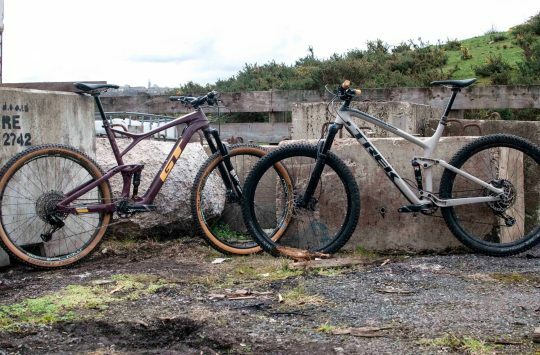 Testing took place on a Whyte T-130, with both SRAM 10-42t and Shimano 11-46t cassettes. 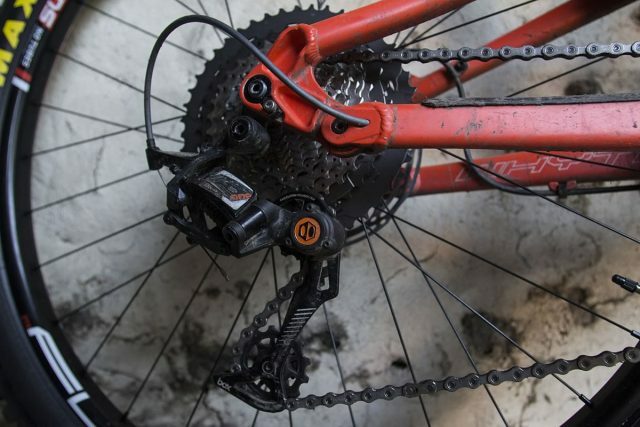 The Box One derailleur features the familiar limit and B-tension screws for simple set-up, but I did encounter a clearance issue between the upper cage and the bulky Horst Link pivot on the Whyte T-130. This wasn’t a problem with the 11T cog on the Shimano cassette, but it was with the 10T cog on the SRAM cassette where the cage fouled on the frame before it could reach the final gear. Box Components sent out a longer B-tension screw to reduce the frame interference issue. A longer B-tension screw helped to achieve the necessary clearance, but the decreased chain wrap left gear changes feeling a little sluggish as a result. 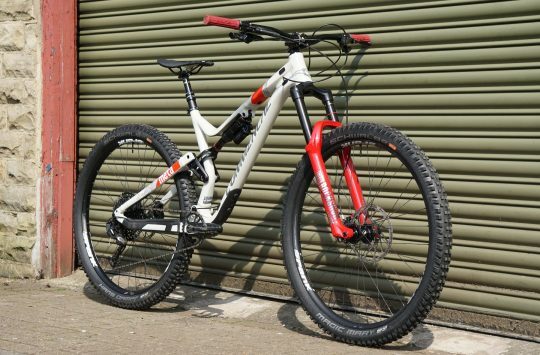 However, hardtails and other rear suspension designs may not have this problem in the first place. 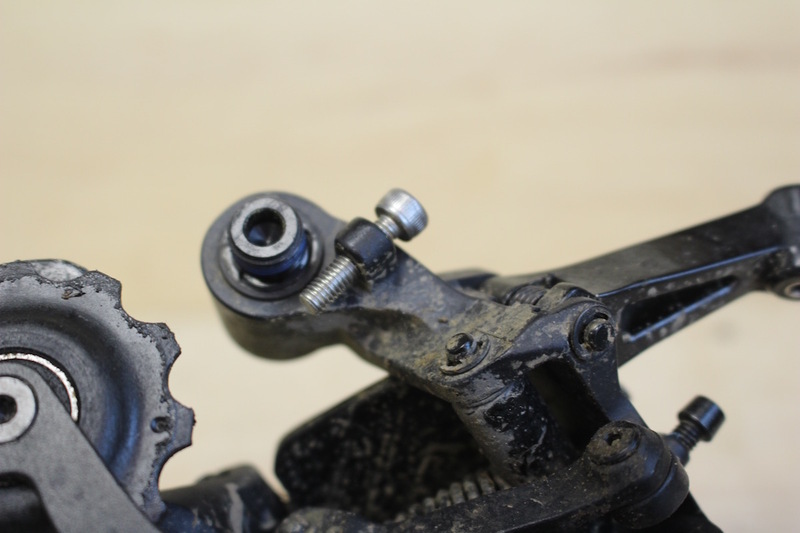 There were clearance issues with our pre-production derailleur and the bulky horst link pivot on the T-130. Another issue I discovered was rear wheel removal. Because the mech doesn’t rotate far back enough on the hanger, you’re left with minimal room to release the cassette from the dropouts. There’s no way of turning the CamClutch off like you can with a Shimano derailleur, so the process is a whole lot harder than it needs to be. As such, I had to unbolt the derailleur to install or remove the rear wheel, which is terribly annoying. Again, this may be a non-issue for other frames. 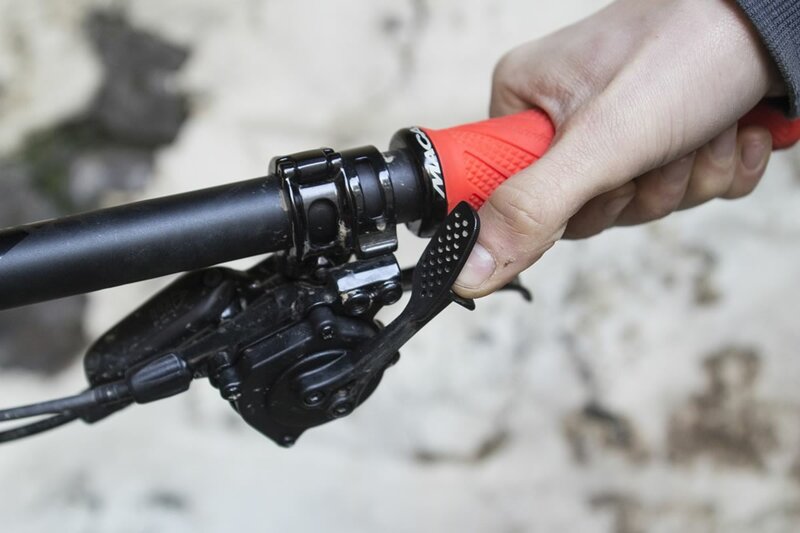 The shifter requires careful setup to get it in the right position for comfortable shifting. Set-up issues aside, Box One does in fact, shift gears, and it does it well. Being unlike anything from SRAM or Shimano, it took me about an hour of trail time before my brain had rewired to the necessary motion required to upshift. But once used to the PushPush design, I never thought about it again. Shift feel at the thumb is an interesting mix, with a light downshift action much like Shimano, and a punchy upshift that’s more SRAM. Sealed bearing jockey wheels are smooth, though the friction clutch on our derailleur lost tension over the test period, resulting in more chain slap and chain dropping. Along with a decent amount of chain-slap, I dropped the chain twice throughout testing, which I’d attribute to the lack of tension in the friction clutch mechanism. 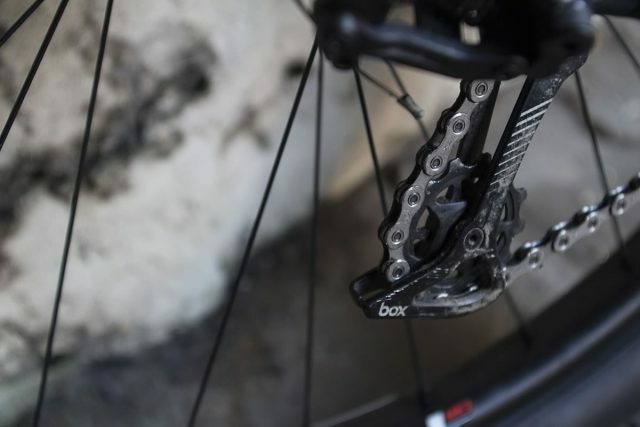 This appears to be a pre-production issue, and Box has stated that tension will be increased in the CamClutch to keep a tighter hold on the chain. 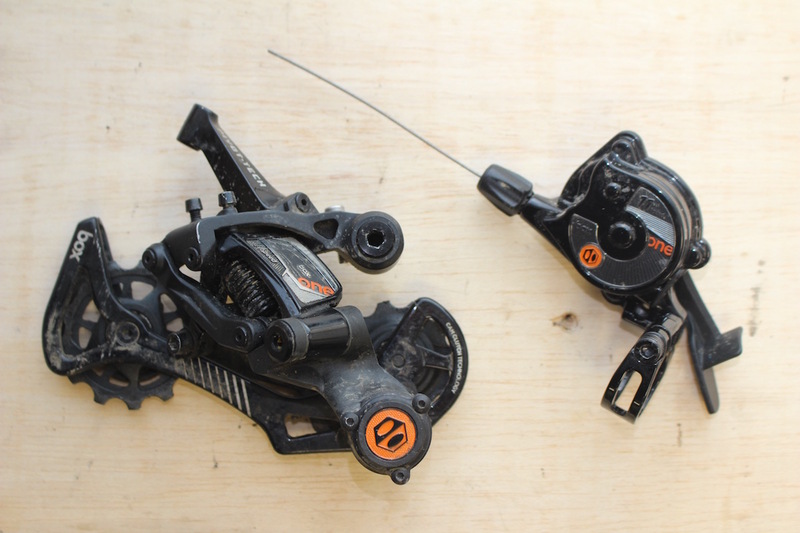 Weight-wise, Box One comes in at 128g for the shifter, and 265g for the derailleur, making it pretty similar to the SRAM GX equivalents. But on a cost basis, Box One is fighting a tougher battle. You could get a SRAM X1 shifter/derailleur combo for the same price as Box One, while the Shimano XTR 11-speed equivalent is only £40 more. Obviously you’re getting a proven track record with both of those bigger brands. Box One works, and it has some promising features, but it needs further refinement before we could fully recommend it. Box is currently working on additional driveline components to complete a full groupset, with a cassette and crankset on the way. It’s also trickling down the technology into cheaper Box Two and Box Three versions, so the SoCal company has big plans for the future. For its worldwide debut into a market duopoly, Box has done a commendable job. Unfortunately our pre-production test units weren’t perfect, with the derailleur lacking compatibility and chain retention. However, the innovative PushPush shifter works well and is highly ergonomic, so providing Box can refine the system for mass production, we’ll have a viable alternative to Shimano and SRAM.